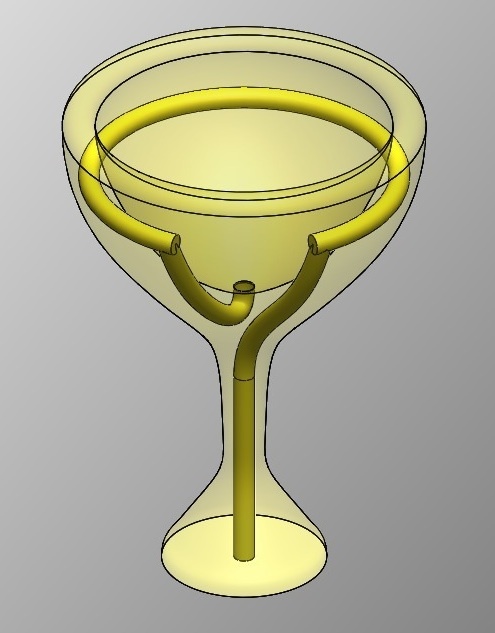 You find the neatest things on thingaverse, like this Pythagorean Cup. The original design is generally to Pythagoras (yes THAT Pythagoras), and is supposed to contain an object lesson about gluttony, or at least getting greedy when you're filling you glass. The idea is that there is a syphon that remains inactive as long as you don't get too greedy when filling the cup. If you get the fluid level up to the top of the syphon, however, watch out. It'll drain through the stem, out the bottom, and into your lap. I suspect it was typically used more as joke on the newby than as an object lesson. That said, it makes a neat lesson about how siphons work, and could be a fun way for kids to learn. You might want to do it outside, though, and stay away from the sticky or staining drinks. The version on thingaverse is a bit different from the traditional design, with the drain tube stealthed by putting it in the in the body of the cup. It's a good lesson on the kind of builds you can do with a 3D printer that are difficult or close to impossible to do by other means.